When it comes to hiring a general contractor, don’t take chances! Be informed so you can make the right decision on who to trust with your investment. Many qualities come to mind when looking to hire a general contractor for your home. 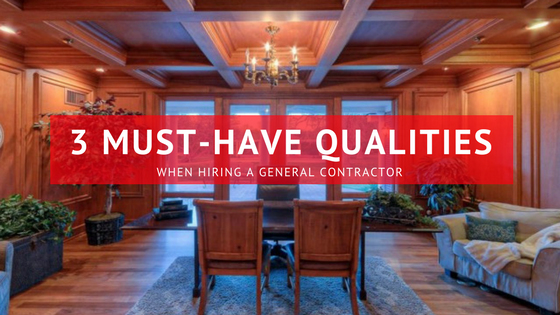 We have narrowed down to the top 3 qualities to take note of when you are interviewing prospects for a general contractor. How long has the general contractor been in business? Do they have examples of work readily available to show you? Do they have the proper licenses and know-how to complete your specific remodel? Before commiting to a general contractor, it is important to know these answers! You can ask them and also do your own research by confirming their history and credibility with the Better Business Bureau. Like any great partnership, communication is key! Take note of how responsive the general contractor is to your inquiries and their preferred communication style. Are they flexible and willing to communicate in a way that best fits your needs? A home remodel is a detailed process with a lot of back and forth between the general contractor and homeowner. Don’t underestimate how beneficial it is to hire someone who communicates clearly and takes the time to listen to what you are saying. Check out their testimonials! Do they have reviews on Google or Facebook? Ask the general contractor if you can reach out to a few past clients to inquire about their experience. A good general contractor won’t hesitate to give out references and feels confident with the relationship they developed with their clients. It can be overwhelming when looking to hire the perfect person for your home remodel. Just remember to take the time to ask important questions and for referrals. When choosing to partner with Arlington Custom Builders, you can rest assured you will be in great hands!